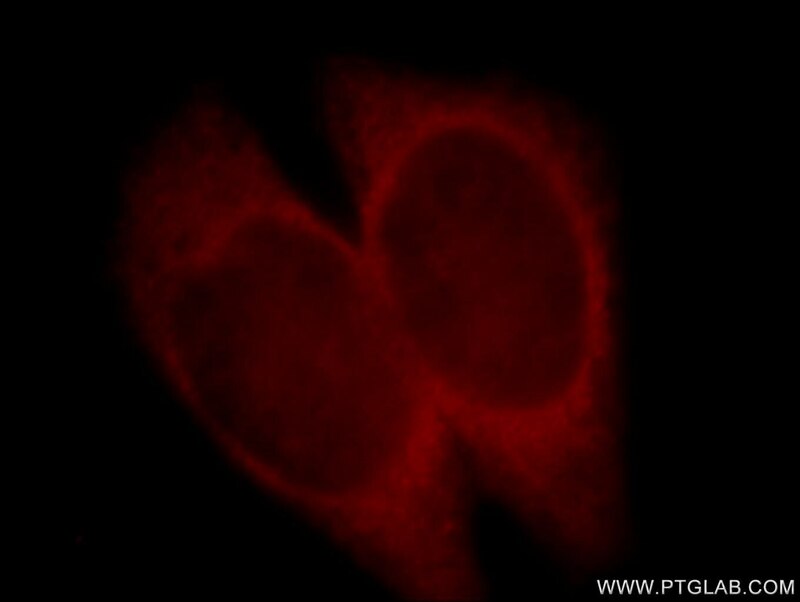 Immunofluorescent analysis of Hela cells, using TNFRSF1B antibody 19272-1-AP at 1:25 dilution and Rhodamine-labeled goat anti-rabbit IgG (red). 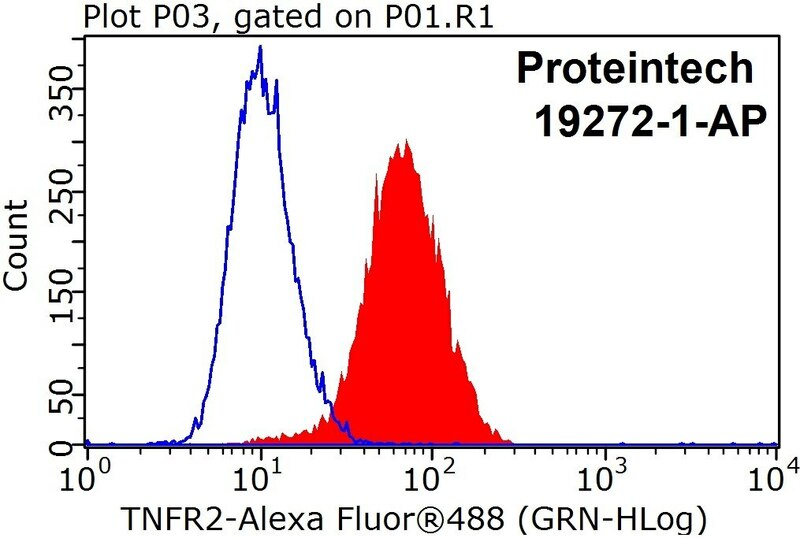 IP Result of anti-TNFR2 (IP:19272-1-AP, 4ug; Detection:19272-1-AP 1:500) with HEK-293 cells lysate 1200ug. 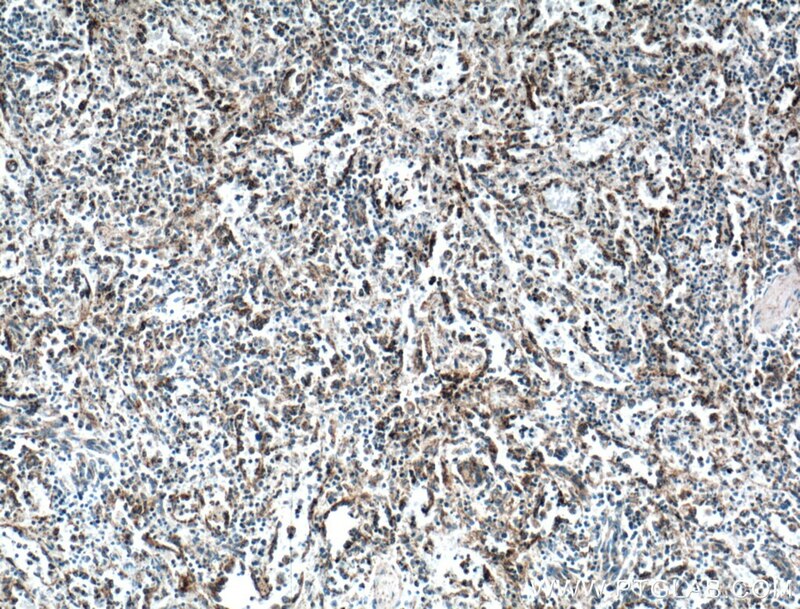 Immunohistochemical analysis of paraffin-embedded human spleen tissue slide using 19272-1-AP( TNFR2 Antibody) at dilution of 1:200 (under 10x lens). 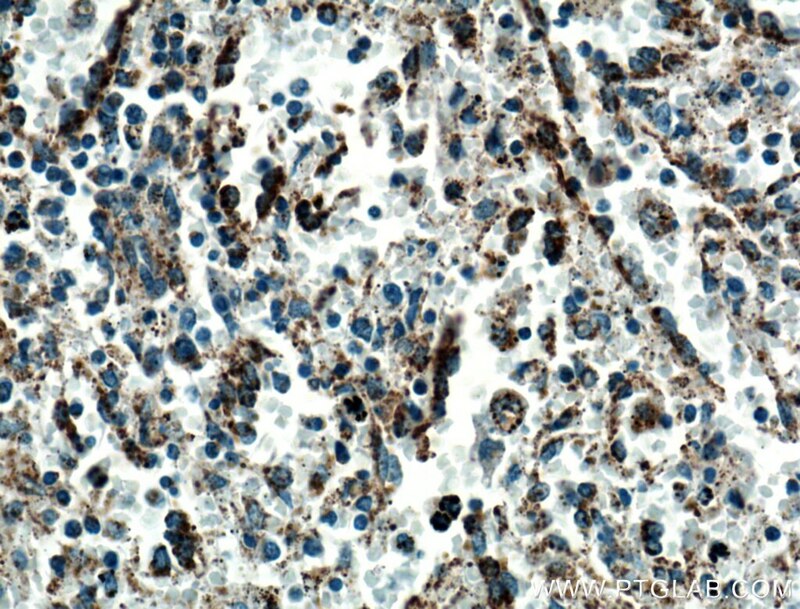 Immunohistochemical analysis of paraffin-embedded human spleen tissue slide using 19272-1-AP( TNFR2 Antibody) at dilution of 1:200 (under 40x lens). Tumor necrosis factor-alpha (TNFA/TNFSF2) is a multifunctional cytokine that plays a key role in regulating inflammation, immune functions, host defense, and apoptosis (PMID: 16407280). TNFA signals through two distinct cell surface receptors, TNFR1 (TNFRSF1A, CD120a, p55) and TNFR2 (TNFRSF1B, CD120b, p75). TNFR1 is widely expressed, whereas TNFR2 exhibits more restricted expression, being found on CD4 and CD8 T lymphocytes, endothelial cells, microglia, oligodendrocytes, neuron subtypes, cardiac myocytes, thymocytes and human mesenchymal stem cells (PMID: 20489699; 22374304). 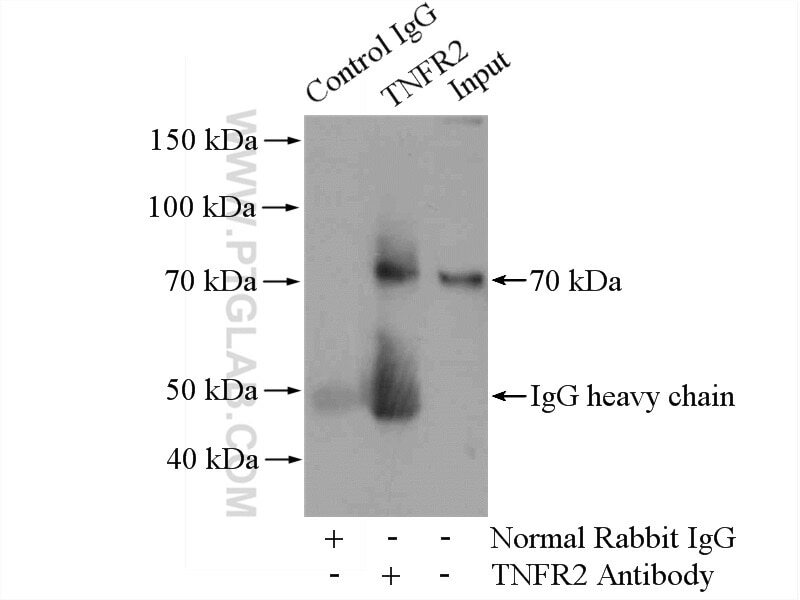 In contrast to TNFR1, TNFR2 does not have a death domain. TNFR2 only signals for antiapoptotic reactions. However, recent evidence indicates that TNFR2 also signals to induce TRAF2 degradation (PMID: 22374304). Various defects in the TNFR2 pathway, due to polymorphisms in the TNFR2 gene, upregulated expression of TNFR2 and TNFR2 shedding, have been implicated in the pathology of several autoimmune disorders (PMID: 20489699). Tumor necrosis factor receptor 2 promotes growth of colorectal cancer via the PI3K/AKT signaling pathway. Tumor necrosis factor receptor 2 may promote the proliferation and drug resistance of Kapras299 and L428 lymphoma cells via the AKT and WNT/β-catenin signaling pathways. Clinical significance of tumor necrosis factor receptor 2 in middle and lower thoracic esophageal squamous cell carcinoma.